Convenient 3-in-1 parasite protection. 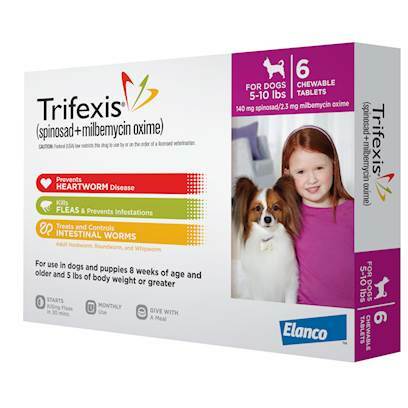 Trifexis (spinosad + milbemycin oxime) is the monthly, beef-flavored tablet that kills fleas and prevents flea infestations, prevents heartworm disease, and treats and controls adult hookworm, roundworm and whipworm infections. This powerful protection is approved for use in dogs and puppies 8 weeks of age or older and 5 pounds of body weight or greater. Adverse reactions to Trifexis include vomiting, itching, ear redness, skin redness and inflammation, loss of appetite, diarrhea, and lethargy. Use Trifexis with caution in dogs with epilepsy. Puppies less than 14 weeks old may excessively vomit. Consult your veterinarian in regard to pregnant or lactating dogs before giving them Trifexis. If your dog experiences any listed effects, contact your veterinarian immediately. Trifexis is not meant for any Collie breed dogs. Do not use ivermectin in addition to Trifexis. Consult your veterinarian regarding the addition of any other medication, supplement, or vitamins. Dog must be tested by a veterinarian, and rid of worms, prior to taking Trifexis. Administer Trifexis orally according to prescribed dosage, based on weight.